It’s easy to take for granted just how much the shift to mobile has changed our lives. Mobile has untethered us from our offices and enabled us to work and share on the go. It’s kept us in touch with loved ones and business associates via social and other web-based platforms at all times of the day and night and in places ranging from the soccer field to the office to the corner coffee shop. Mobile has also changed the way we use and think about email. Now, roughly 42% of all email is opened on a mobile device (27% on iPads, 56% on phones). Indeed, mobile has grown 366% over the past five years. (Source: Silverpop.) 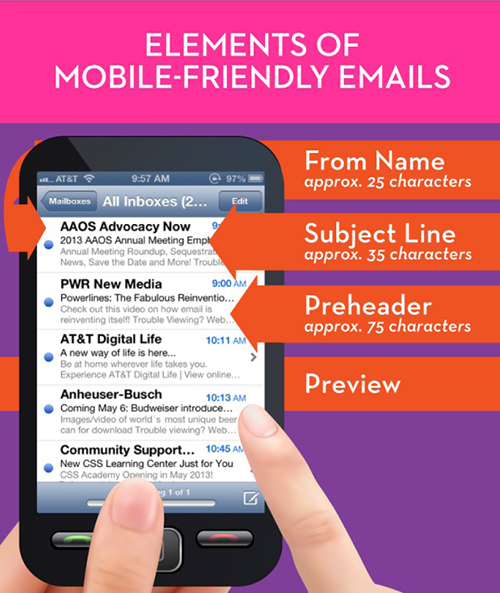 To ensure your emails are effective it is now essential to think about how your emails look and work on mobile devices. It’s trickier than it sounds. For one thing, screen sizes vary from about 2.3” wide (iPhone width) to 7.3” wide (Nexus 7 width), and some people are even looking at email on their increasingly large TV screens. This means from and subject lines matter more than ever. And now, you want to consider writing a preheader for your email as well. Never heard of a preheader? In short, they’re tertiary inbox content that appear as visible text on mobile devices. In addition to keeping the info honest, concise and interesting, keep ideal character lengths in mind as well. From lines should be approximately 25 characters or less. Subject lines should be approximately 35 characters or less. Preheaders should be approximately 75 characters or less. 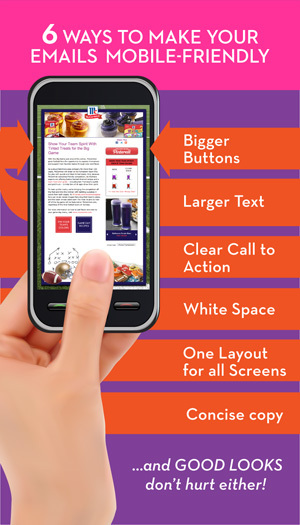 Even with the many sizes and rendering considerations, touch is increasingly a unifying characterisitic of the mobile experience. Put another way, tap is now the new click! This means links are simply less precise, which has an impact on best practices. Consider using buttons and text links in combination—buttons work well on mobile devices but text links render better through email. To-do’s include turning pop-ups off for mobile users, thinking through registration pages for B-to-B email, and just generally ensuring that your email or web page is easy to navigate and finger friendly! And good looks don’t hurt either! This article was originally published in Powerlines, PWR New Media’s newsletter.